This report contains the main outcomes of the 39th Session of the UNESCO General Conference held in November 2017, along with the interventions made by the Canadian delegation to the Education Commission. At the 39th Education Commission meeting, members set priorities and adopted the 2018–19 education budget. The commission also addressed other issues, including a global convention for the recognition of higher-education qualifications, and UNESCO’s role in the implementation of the SDG4-Education 2030 Agenda. The 2016 International Summit on the Teaching Profession was hosted by the Standing Conference of the Ministers of Education and Cultural Affairs of the Lander in the Federal Republic of Germany, in partnership with the Organisation for Economic Cooperation and Development, and Education International. The summit brought together official delegations of ministers of education, union leaders, outstanding teachers, and other education experts, as well as observers, from 22 high-achieving or rapidly improving countries, as measured by student performance in OECD's Programme for International Student Assessment (PISA). While previous summits focused on raising the quality and status of the teaching profession, teacher evaluation, and the challenges of providing equitable access to excellent teaching, the theme of the 2016 summit was “Teachers' Professional Learning and Growth: Creating the Conditions to Achieve Quality Teaching for Excellent Learning Outcomes,” and centred on the knowledge, skills, and character dispositions that successful teachers require; the policies that help teachers acquire the competencies they need to be effective; and how governments can implement these policies effectively. The report captures these discussions. This report contains the main outcomes of the 38th Session of the UNESCO General Conference held in November 2015, along with the interventions made by the Canadian delegation to the Education Commission. The 38th session focused on a variety of issues, including the commission's 2016–17 budget; the Education 2030 agenda; preparation of a global convention on the recognition of higher-education qualifications; and two recommendations: one on adult education and one on technical and vocational education and training. This report summarizes the main issues discussed at the 2014 Education World Forum held in London, UK, from January 19 to 22, 2014. Under the theme of “Planning for 2015 — Policy-making catalyst for a decade ahead: measurement, reach and enterprise,” education ministers and officials discussed issues such as the impact of data on learning, driving improvement in education, and youth employment challenges and solutions. The 2015 International Summit on the Teaching Profession was hosted by CMEC and the Learning Partnership, a Canadian national education non-profit, and organized in cooperation with the Organisation for Economic Co-operation and Development (OECD) and Education International. The summit brought together official delegations of ministers of education, union leaders, outstanding teachers, and other education experts, as well as observers, from 20 countries. The theme of the summit was “Implementing Highly Effective Teacher Policy and Practice,” and three interrelated topics that are critical to the success of education systems were discussed: promoting and developing effective leadership; valuing teachers and strengthening their effectiveness; and encouraging innovation to create 21st-century learning environments. The report captures these discussions. 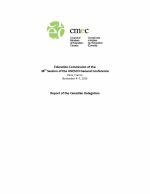 This report summarizes the main issues discussed at the 2013 OECD Informal Meeting of Ministers of Education, “Fostering skills and employability through education,” Istanbul, Turkey, on October 2–4, 2013. The meeting focused on a variety of skills-related issues and included briefings on the Programme for the International Assessment of Adult Competencies (PIAAC) and the Programme for International Student Assessment (PISA). This report summarizes the main issues discussed at the fourth International Summit on the Teaching Profession (ISTP), which took place in Wellington, New Zealand, on March 28 and 29, 2014. The summit brought together more than 300 teaching professionals and policy-makers around the theme of “Excellence, Equity and Inclusiveness — High-Quality Teaching for All.” The report provides the main messages conveyed by the Canadian delegation to the meeting participants, including the announcement that Canada will host the 2015 summit in Banff, Alberta. The joint declaration offers three principles to guide work on the alignment of education and skills training and labour-market needs and proposes specific pan-Canadian activities. Learn Canada 2020 is the framework that provincial and territorial ministers of education, through the Council of Ministers of Education, Canada, are using to enhance Canada's education systems, learning opportunities, and overall educational outcomes. The document presents the four pillars of lifelong learning: early childhood learning and development, elementary through high school, postsecondary education, and adult learning and skills training. Within the four pillars, ministers have identified eight specific activity areas and accompanying objectives. As well, the document includes statements on key partners and stakeholders and communication with Canadians.